The Reserve Bank of Australia will release the Minutes of its latest meeting, seen maintaining the neutral-to-dovish stance. China will release minor data ahead of the more relevant Q1 GDP scheduled for Wednesday. The AUD/USD pair ended the day as it started it, in the 0.7170 price zone, unable to attract investors in a slow start to the week. Australian macroeconomic calendar remained empty, as well as that of most major economies, preventing investors from taking directional bets. Australia will release Tuesday the Minutes of the latest RBA meeting, and early Thursday, March employment figures. Also, China will publish during the upcoming hours the March House Price Index and Foreign Direct Investment. This last will release later this week Q1 GDP, expected to show that economic growth continued slowing in the first three months of the year. Seems unlikely the Aussie could run ahead of the news. As for the RBA Meeting's Minutes, the market expects little, but for policymakers to repeat that they will continue monitoring developments and set the monetary policy in consequence. 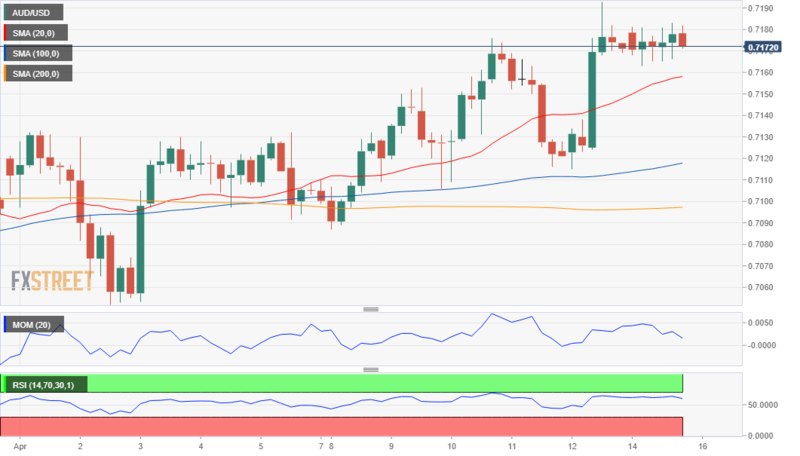 The pair retains its positive stance in the short-term, given that, in the 4 hours chart, the Momentum indicator continues heading north above its mid-line, while the 20 SMA advances below the current level and above the larger ones. The RSI indicator in the mentioned timeframe lacks directional strength, consolidating at 59. The pair would have a hard time to surpass the 0.7200 figure with the RBA in the way, while a downward extension could be expected once below 0.7135, now the immediate support.